What is Spotamo & How Does it Work? 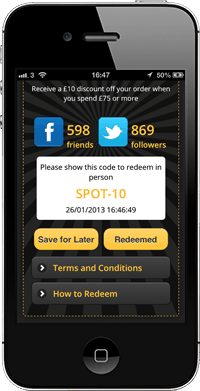 Spotamo enables you to save money at local shops by simply sharing offers with your friends. 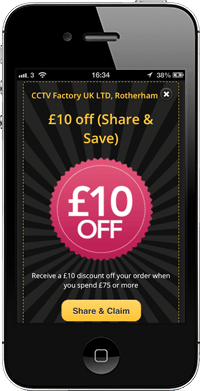 Just Share & Claim the offers you'd like to use, it's completely free and there's no limit to how many offers you can claim. Finding Spotamo offers is really easy with the Spotamo mobile app or website. Why not see if any of our current offers take your fancy? Claimed offers will automatically be shared on your social networks - it's simply a status update telling your friends about the offer so they can enjoy it too. After claiming the offer, just show your screen to redeem in person. Or press How to Redeem to see other ways to get the offer. If you're not ready, just press Save for Later.